OK, so it’s cruel, just cruel, to talk about gluttony on the day after Thanksgiving *, our annual eat-too-much-and-get-indigestion festival. I also ate too much yesterday and took Digels before I went to bed. Then this morning I had (shame on me) a piece of pie and many leftovers for breakfast. And I’m not sorry. It was part of a very happy family gathering, and I totally enjoyed it. But now, before I get into the habit and before my internist has to lay into me, what better time to reflect on gluttony? * That is, Thanksgiving Day in the United States. Canadian Thanksgiving Day was a month ago. By the way, I read that some millennials won’t celebrate Thanksgiving Day because of colonial oppression of native Americans. Good issue, but they should dig a little deeper. Despite popular mythology, the connection with the Pilgrims is pretty nebulous – especially in the case of Canadian Thanksgiving Day! All such feasts derive chiefly from traditional harvest festivals. Today Thanksgiving has become a lovely day of general gratitude and family get-together. Enjoy it! What about eating Thanksgiving turkey during the Advent Fast? I may be wrong, but I have always understood that the Orthodox Fasting Police take Thanksgiving off and on that day do not peer into our windows to see what’s going on. C.S. Lewis, in his book Screwtape Letters, Chapter XVII, imagined a senior devil writing to a junior devil about how to tempt a certain Englishman: “One of our great achievements of the last hundred years has been to deaden the human conscience [regarding gluttony], so that by now you will hardly find a sermon preached or a conscience troubled about it in the whole length and breadth of Europe.” And not only in Europe. 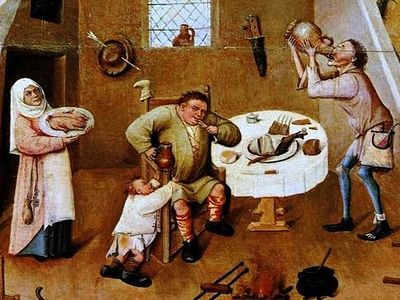 I had often warned people against greed and lust and pride and envy, but till I began working on this article (for my parish, some years ago) I had not even thought seriously about gluttony. Our Antiochian Pocket Prayer Book, which we’re using as a general guide in this series, says gluttony is “the habit of eating and drinking too much”. I think that is not an adequate definition (we need to go deeper) but let’s start there. What is “too much”? As I was preparing this article, while eating yet another piece of chocolate candy, I wondered: Am I now committing the sin of gluttony? So in order to avoid dealing with that… I decided to think about my grandparents. My Grandpa Fred was a small man, 5’6” and 120 pounds on a good day, and he ate like a horse, we used to say. After Grandma died he would visit us and nearly clean out the refrigerator. When he was 89 he told me that all his life he had eaten more food than he wanted, just to keep from losing weight. (Don’t you wish…?!) My Grandma Rosie, on the other hand, was more than pleasantly plump, but she ate little. She said she could sniff food and gain five pounds. All her life she would make these big meals and then have to watch as Grandpa shoved them down. So were either of my grandparents gluttons? Grandpa who looked like he was eating too much but was not? Grandma who looked like she had eaten too much but had not? I think neither was guilty. They just had very different metabolisms. The point is that gluttony cannot be judged by outward appearances. What we’re interested in here, as with all deadly sins, is the inner spirit of gluttony. However, gluttony is indeed “eating and drinking too much”, that is, more than is good for us. Once most people did hard physical labor and ate a lot without being gluttons. For many people today with our desk jobs, eating the same amount is gluttony, and I’m afraid it shows. Above: hot dog eating contest. Yes, he ate them all. God only knows why. When I used to return to America after traveling in Europe, almost the first thing I noticed was how many, uh, well, fat people we have here. I swim regularly at our local Y where I see things that ought not to be seen. Currently almost 67% of American adults are overweight. 30% are obese. 5% of American adults are morbidly obese – a 400% increase since 1986. (You can find these statistics online from many sources.) Some of this can be caused by bad metabolism. It cannot all be. The fact that we do not eat large portions may blind us to our gluttony, how much we focus on pleasing our palates. So… can I walk past that box of chocolates and not take one? Do I get grumpy when I can’t get my cappuccino? Do I control my appetites or do they control me? Here the monastics witness to the fact that one can lead a good life without fine food and drink. After a visit to Mount Athos, I described food there as “medieval Greek peasant food”. I thought it was awful. But my friend Father Barnabas (+memory eternal) ate it daily, and he appeared to be a very happy man. Jesus “came eating and drinking” Matthew 11:19, Luke 7:34 His first miracle was at a wedding feast. One of his images of the Kingdom of God was a feast, a wedding banquet in the Kingdom of heaven, of which the Holy Eucharist is our foretaste. Consider that some of our happiest memories are of Church and family feasts: Pascha, Thanksgiving, Christmas, birthdays, anniversaries, church suppers and dinners and Sunday coffee hours – most of which we tend to remember chiefly not because of the food and drink, but because of the fellowship, the joy of being together, and certainly the great events that lay behind the feasting. Such feasting is not chiefly about food but about family and love. Nor are preparing and enjoying good meals unworthy activities. Cooking is an art, and any good thing made with care and skill is to be appreciated. God has made all things to be enjoyed. Though let’s face it: food and drink are not in the same class as painting or music or literature. They endure for a long time, but even the most beautifully prepared food is eaten quickly – and is gone. And, back to Amos, anything done while ignoring the needy is of the devil. 1 Eating and drinking too much affects our health, fills our arteries with cholesterol, destroys our livers, hurts the body God gave us. If it destroys our health, we needlessly become a burden on family, friends and society. That is culpable sin. 2 A general loss of self-control. If we cannot control something which we do so often, three meals a day almost every day usually with snacks in between, this is almost certain to spread into the rest of our life. 3 Gluttony dulls our spiritual senses. Overeating makes us sleepy or nauseous. Over-drinking make us sleepy or giddy or sometimes nasty. How can we walk in the presence of God when we’re in that condition? 5 How much has gluttony affected the spirit of our society? Somehow despite all our churchgoing, so many modern America people want immediate material gratification. (Watch HGTV!) Increasingly we ignore the poor and the hungry. I wonder how much our self-indulgent eating habits are behind all this. Is it because we have become a nation of gluttons? Giving up certain food and drink for certain days and seasons is the test to see whether we control of our appetites. If we cannot do so, then we know that gluttony controls us. But most American Christians no longer fast. Protestants officially eliminated it long ago. American Roman Catholics are now required to fast on only two days: Ash Wednesday and Good Friday. (In Wisconsin the old Friday night fish fry still continues, but hardly anybody remembers why.) They fast for only an hour before receiving Holy Communion. At a long Mass one could legally snack up to the Gospel! How times have changed. Abraham Lincoln and other presidents of old declared national days of prayer and fasting. They couldn’t get by with days of prayer any more, and it would never occur to them to declare a day of fasting. What? Intentionally deny ourselves something we want? Why would we do that? Fasting by ourselves is difficult. Keeping the fasts with the Church lends moral support. But be careful. At Saint Nicholas, Cedarburg we once had Lenten potluck suppers, strictly keeping the fasting rules, but people brought so many delicious Lenten dishes that we all overate and gained weight during Lent! We simplified our suppers. Remember that in fasting, as in all things, we Orthodox are not legalists. For reasons of health or youth or age or family issues, for example, exceptions can be made to our fasting rules. But keep the Fast! 2 Worship and pray more. “Set your minds on things above, where Christ is seated at the right hand of the Father.” Colossians 3:2 It’s safer (I hope) to have my cappuccino just after we have sung weekday Matins, as we do at Saint Nicholas. Always say prayers before meals. It’s harder to be a glutton after that. I think. 3 To repeat, give to the needy. There are so many who are hungry today, both in America and overseas, and sadly, as the poor have grown poorer, much government money for food programs has been cut back. We Christians need to try to take up the slack. Work at a meal program, serving food to the needy; many parishes take this on as a project. Work at a food pantry. During the Advent and Great Lenten Fasts, I hope your church has a special food drives to provide food or money for the pantries. Support Second Harvesters and similar groups. Maybe we who eat so well can be rescued from gluttony by giving much food and money to those who are hungry. If we conquer gluttony the surprising result is that we enjoy food and drink not less but more. Is it really enjoyable to “eat and drink too much”? I never delight in meals so much as after not snacking between meals during Lent. The most delicious thing I ever drank was a lemonade at a monastery, after I had been working outdoors and had had nothing to drink all afternoon. Wine is pleasant only when one is sober enough to taste it. Is it really a treat to pick over food and complain about it? If we can get our fussiness out of the way, we will enjoy food more – and people, too. At some of the best meals I ever had, I scarcely remember the food, because I was enjoying the people I was with so much. And does food ever taste as good as it does on Pascha, after the end of the Great Lenten Fast? Where food and drink are concerned, less really is more. For the Great Feast is coming. “Blessed are those who are invited to the marriage supper of the Lamb!” Revelation 19:9, where, as Saint Basil the Great wrote in his lovely prayer, “the voice of those who feast is never silent, and the delight of those who behold the inexpressible beauty of your countenance passes all telling”.